Background: Low levels of estrogen can cause osteoporosis and usually occur during a woman's menopausal phase. Osteoporosis can lead to bone resorption, the absence of osseointegration, and implant failure. The aim of this study is to determine the expression of transforming growth factor-beta 1 (TGF-β1), runt-related transcription factor (RUNX2), and osteoblasts in mandibular rats with low levels of estrogen. Materials and Methods: This study is an in vivo experimental research. Female Wistar rats (n = 18) were divided into two groups: (1) Postsham surgery and (2) ovariectomy group. After 12 weeks, the rats were sacrificed to identify the level of estrogen, while histological analysis was conducted to determine the level of osteoblast and the expression of TGF-β1 and RUNX2. The data were analyzed using t-test (P < 0.05). Results: There were significant lower levels of estrogen and osteoblast among the ovariectomy group compared to the postsham group (P < 0.05). RUNX2 levels were found to be significantly higher in the ovariectomy group than that in the postsham group (P < 0.05). However, there were no significant differences between TGF-β1 levels within the ovariectomy and postsham groups (P > 0.05). Conclusion: Ovariectomy can lead to decreased osteoblastogenesis in mandibular bone by the reduced level of osteoblast and the increased expression of TGF-β1 and RUNX2. Every year in Indonesia, the number of elderly people above 60 years old increases. Within the health sector, elderly patients are particularly vulnerable due to the degenerative process related to aging. In this condition, many elderly people need prosthodontic treatment. One of the common degenerative diseases is osteoporosis, especially in postmenopausal women., The decrease in bone mass of 2%–5% per year is related to reduced calcium uptake due to a decrease in the level of estrogen which is crucial for bone growth and repair. The reduced bone mass may, in turn, increase the risk of osteoporosis. Osteoporosis can negatively impact the condition of teeth and oral cavities. Indeed, tooth loss is one complication of osteoporosis affecting the oral cavity. Osteoporosis not only occurs in lumbar, femoral, and radial bones, but also in the jaw bone, therefore demanding the attention of dentists., Osteoporosis also causes resorption of alveolar bone and reduced mandibular cortex thickness which increase the risk of periodontal disease and tooth loss. Mandibular bone remodeling failure causes alveolar bone loss in surrounding teeth which increases the risk of tooth mobility culminating in tooth loss. One treatment option within prosthodontics is dental implant which is a new and effective remedy for tooth replacement. Dental implants require appropriate bone density due to the latter's relationship with the mechanical immobilization of such implants during the healing process. Bone density plays an important role within the equal distribution and transmission of denture load on the implants within the bone. Osteointegration between implant and bone is a key to the success of implant treatment. The study showed that implant failure might occur due to low bone density which leads to incomplete osseointegration of the implant and bone. Therefore, for women suffering from osteoporosis who require implant treatment, early detection of the condition is a prerequisite to the prevention of dental implant failure. Nowadays, effective diagnosis of osteoporosis still relies on X-ray examination to determine the bone mineral density.,, The last study demonstrated that X-ray examinations do not provide an adequate result to diagnose osteoporosis. The detailed condition of mandibular osteoporosis has yet to be studied. Research on the state of the mandibular bone cannot be conducted on humans. Therefore, the study reported here involved the use of animal osteoporotic model. It is hypothesized that osteoporotic bone also found in mandibula in low level of estrogen and can affect the osteoblastogenesis. A definitive diagnosis of an osteoporotic mandible is necessary for successful prosthodontic treatment. The aim of this study is to determine the expression of TGF-β1, RUNX2, and osteoblast in mandibular rats with low levels of estrogen. This research constituted an in vivo experiment incorporating the use of posttest group design and had been granted ethical approval clearance by the Committee of Ethical Clearance of Health Research, Faculty of Dental Medicine, Universitas Airlangga No. 14/KKEPK. FKG/I/2016. Sample size was calculated using Lemeshow formula. The sample consisted of 18, 3-month old, female Rattus norvegicus strain Wistar rats weighing 180–200 g which were kept in cages for a week before ovariectomy and sham surgery was carried out. The rats had fasted for 6–8 h before surgery. Ketamine 10% 1 cc and Xyla 1 cc were injected intramuscularly into the semi-tendinous muscle and valium 0.2 mg/kg in gluteus was administered as an anesthetic. An ovariectomy was performed through ventral and umbilical incision as far as the pubic region. Ovarium and fallopian blood vessels were ligated separately, while the bilateral ovaries and periovarian fat were removed entirely. The peritoneal incision was closed by means of a simple suture prior to skin closure. The sham surgery group alone underwent peritoneal incision without the removal of the ovarium before being closed with a simple suture and skin closure. The rats were released postoperatively within the cage on a normal diet for 12 weeks. Three ml blood samples for estrogen examination were taken directly from the apex of the heart using a 5 ml disposable syringe after the rats had been anesthetized. An ELISA Kit (Sigma-Aldrich, St. Louis, MO) was used for estrogen-level examination. At 12 weeks postintervention, the rats were euthanized and the mandibular bone was taken for microscopic examination. Immunohistochemistry (IHC) analysis was conducted using the monoclonal antibody for TGF-β1 (Sigma-Aldrich, St. Louis, MO), while RUNX2 (Sigma-Aldrich, St. Louis, MO) detection and histological examination were conducted using Meyer's hematoxylin staining (Sigma-Aldrich, St. Louis, MO). The percentage of estrogen level, osteoblast, TGF-β1 and RUNX2 marker-positive cells are depicted as the mean value ± standard deviation Statistical significant was conducted using t-test, P < 0.05 being considered a significant result. This research was performed using 18 Wistar rats as postsham surgery with a control group and postovariectomy surgery with an interventional group. Immunohistochemical and histopathological preparations of a mandibular bone sample in the molar region were made, with the expression of TGF-β1, RUNX2, and osteoblast number on the control, postsham, and ovariectomy groups being analyzed using a light microscope. Microscopic evaluation using IHC revealed an expression of TGF-β1 and RUNX2 as shown in [Figure 1] and [Figure 2]. Microscopic evaluation using histopathology revealed an osteoblast [Figure 3]. The black arrow indicates an expression of TGF-β1, RUNX2, and osteoblast under microscopic examination. Figure 1: Immunohistochemistry staining from SHS and OVX for TGF-β1 expression. Black arrow shows an expression of TGF-β1. SHS: Postsham surgery group; OVX: Postovariectomy group; TGF-β1: Transforming growth factor-beta 1 × 400. Figure 2: Immunohistochemistry staining from SHS and OVX for RUNX2 expression. Black arrow shows an expression of RUNX2. 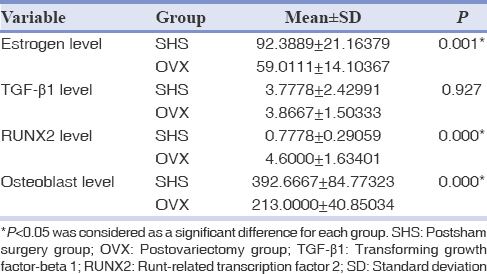 SHS: Postsham surgery group; OVX: Postovariectomy group; RUNX2: Runt-related transcription factor × 400. Figure 3: Histopathology examination from SHS and OVX for osteoblast level. Black arrow shows an osteoblast. SHS: Postsham surgery group; OVX: Postovariectomy group × 400. The results of this study, illustrated as mean values of estrogen, TGF-β1, RUNX2, and osteoblast level for each group, are presented in [Table 1]. There were higher levels of estrogen and osteoblast in the postsham surgery group than its postovariectomy counterpart. However, lower levels of TGF-β1 and RUNX2 were revealed in the postsham surgery group than the postovariectomy group. According to statistical analysis, there was a significant difference in estrogen, RUNX2, and osteoblast level between the two groups (P < 0.05). Meanwhile, there was no significant difference in TGF-β1 between the two groups (P > 0.05). This study was conducted using the R. norvegicus strain of Wistar rats as an animal subject. These rodents are commonly used as a clinical experiment subject due to their rapid regeneration and ease of maintenance. Rats represent the best subjects for osteoporosis research due to the similarity of their trabecular bone and bone regeneration ability with that of postmenopausal women. Estrogen deficiencies in osteoporosis induce bone resorption, resulting in changes to bone microarchitecture. Bone formation disruption can occur in postmenopausal women due to estrogen deficiencies. In osteoporosis, bone formation potential will be limited as shown by the decreased capacity of osteoblasts to form a bone matrix. Histological analysis confirmed osteoporosis to be determined by a decrease in trabecular bone, while a severe osteoporosis condition leads to thin trabecular bones and causes functional insufficiency. In this study, there was no significant difference between TGF-β1 expression in the normal individuals and osteoporotic patients. This result can be produced by the varying role of TGF-β1 at each stage of bone formation. TGF-β1 stimulates RUNX2 at the differentiation stage of osteoblastogenesis and inhibits the continuing phase after osteoblast maturation. RUNX2, as an important transcription factor in bone formation, is regulated by TGF-β1 and BMP2. TGF-β1 induces the expression of RUNX2, thereby potentially increasing a differentiation, but at an advanced phase, TGF-β1 will inhibit the expression of RUNX2 to prevent mature osteoblast differentiation into osteocytes. There was an increase in TGF-β1 expression at an early stage of injury response. TGF-β1 is produced at the fracture site by platelets, inflammatory cells (monocytes and macrophages), osteoblasts, osteoclasts, and chondrocytes. In this study, TGF-β1 was expressed at the end of the 12th week after the ovariectomy had been performed, whereas other studies have shown that TGF-β1 expression presented at an early stage in the injury response., Therefore, there is no significant difference between TGF-β1 expression in the normal and osteoporosis groups. TGF-β1 is the largest bone growth factor and the most prominent among the three forms of TGF-β. TGF-β1 produced osteoblasts as inactive propeptides which are incorporated into the bone matrix. During resorption, an inactive propeptide will be activated at the resorption site. TGF-β1 inhibits osteoclast activity and stimulates preosteoblast proliferation and differentiation to support bone formation. TGF-β1 will be mobilized by osteoclasts and attract MSC to the site to promote osteoblast differentiation. In this study, there was a significant difference between the RUNX2 expression in an ovariectomy group and that of a normal group. RUNX2 enhancement means that bone remodeling still occurs at the 12-week postovariectomy, although some osteoblasts may have matured into osteoids. MSC differentiation into osteoblast occurs in several phases with each phase is being characterized by a particular osteoblast marker gene. RUNX2 regulates the expression of the osteoblast marker gene in conjunction with osteocalcin-specific element 2 (OSE2), a binding site for RUNX2. OSE2 was found in the promoter region of all major osteoblast marker genes. RUNX2 has several isoforms, which have their own roles and functions at each stage of osteoblast differentiation. RUNX2 type 1 in mice, that have two main isoforms, has been found in osteoprogenitor and preosteoblasts cells, indicating that it has an important role in the early stages of osteoblastogenesis, while in the final stage, RUNX2 type 2 induces osteoblast maturation. It has been shown that at week 12, osteoblastic differentiation remains ongoing in the osteoporosis group. RUNX2 is important for osteoblast differentiation and bone formation, being a transcription factor of DNA-specific binding that regulates and controls the development of osteoblasts from MSCs and maturation into osteocytes. Although necessary for transcriptional gene and osteoblast development, RUNX2 is an inadequate optimal expression gene for bone formation. In accordance with its function as a master organizer, changes in the RUNX2 expression level will be related to skeletal bone disease. A decrease in bone density is an early sign of osteoporosis. One method of determining such a decline is to perform osteoblast and osteoclast examinations. The results of this study indicate a significantly smaller number of osteoblasts in the osteoporosis group compared to the normal group, which is associated with decreased estrogen level. The lower levels of estrogen lead to the suppression of MSC production and the number of preosteoblasts. And that of osteoblasts will also decrease. The mineralization process begins 30 days after osteoid deposition and terminates on the 90th day within the trabecular bone. It also occurs on the 130th day within the cortical bone. Hence, by the 12th week after the ovariectomy has been performed, mineralization of the trabecular bone occurs. From the results of this study, it can be concluded that the condition of low estrogen levels can lead to decreased osteoblastogenesis in the mandibular bone, characterized by increased expression of TGF-β1 and RUNX2 and a decline in the number of osteoblasts. The authors of this manuscript declare that they have no conflicts of interest, real or perceived, financial or nonfinancial, in this article. Pramono T. Badan Pusat Statistika. Statistik Penduduk Lanjut Usia; 2014, c2015. Available from: https://www.bps.go.id/index.php/publikasi/1117. [Last accessed on 2017 Aug 15]. Partida MN. Geriatric prosthodontic care. Dent Clin North Am 2014;58:103-12. Maclaughlin EJ, Sleeper RB, McNatty D, Raehl CL. Management of age-related osteoporosis and prevention of associated fractures. Ther Clin Risk Manag 2006;2:281-95. Hoffman BL, Schorge JO, Bradshaw KD, Halvorson LM, Schaffer JI, Cunningham FG. Reproductive endocrinology, infertility, and the menopause. In: Williams Gynecology. 3rd ed. New York: McGraw-Hill Education; 2016. p. 471-90. Nicopoulou-Karayianni K, Tzoutzoukos P, Mitsea A, Karayiannis A, Tsiklakis K, Jacobs R, et al. Tooth loss and osteoporosis: The OSTEODENT study. J Clin Periodontol 2009;36:190-7. Speroff L, Fritz M. Menopause and the perimenopausal transition. In: Clinical Gynecologic Endocrinology and Infertility. 8th ed. Philadelphia: Lippincott Williams & Wilkins; 2011. p. 673-747. Kafadar IH, Güney A, Türk CY, Oner M, Silici S. Royal jelly and bee pollen decrease bone loss due to osteoporosis in an oophorectomized rat model. Eklem Hastalik Cerrahisi 2012;23:100-5. Nobuhara WK, Carnes DL, Gilles JA. Anti-inflammatory effects of dexamethasone on periapical tissues following endodontic overinstrumentation. J Endod 1993;19:501-7. Keen R. Pathology of osteoporosis. In: Clunie G, Keen R, editor. Osteoporosis. 2nd ed. New York: Oxford University Press; 2014. p. 1-7. Salim S. Correlation between estrogen and alkaline phosphatase expression in osteoporotic rat model. Dent J 2016;49:76-80. Available from: http://www.e-journal.unair.ac.id/index.php/MKG/article/view/2995. [Last accessed on 2017 Aug 10]. Manolagas SC, O'Brien CA, Almeida M. The role of estrogen and androgen receptors in bone health and disease. Nat Rev Endocrinol 2013;9:699-712. Marcu F, Bogdan F, Muţiu G, Lazăr L. The histopathological study of osteoporosis. Rom J Morphol Embryol 2011;52:321-5. Misch CE. Rationale for dental implants. In: Contemporary Implant Dentistry. 3rd ed. St. Louis, Canada: Mosby Inc.; 2008. p. 3-21. Saini R. Dental implant: A review. J Dent Sci 2013;1:8-11. Bandela V, Munagapati B, Karnati RK, Venkata GR, Nidudhur SR. Osteoporosis: Its prosthodontic considerations – A review. J Clin Diagn Res 2015;9:ZE01-4. Wang Z, Goh J, Das De S, Ge Z, Ouyang H, Chong JS, et al. Efficacy of bone marrow-derived stem cells in strengthening osteoporotic bone in a rabbit model. Tissue Eng 2006;12:1753-61. Marie PJ, Kassem M. Osteoblasts in osteoporosis: Past, emerging, and future anabolic targets. Eur J Endocrinol 2011;165:1-10. Chen G, Deng C, Li YP. TGF-β and BMP signaling in osteoblast differentiation and bone formation. Int J Biol Sci 2012;8:272-88. Kaye EK. Bone health and oral health. J Am Dent Assoc 2007;138:616-9. Dervis E. Oral implications of osteoporosis. Oral Surg Oral Med Oral Pathol Oral Radiol Endod 2005;100:349-56. Devlin H, Horner K. Mandibular radiomorphometric indices in the diagnosis of reduced skeletal bone mineral density. Osteoporos Int 2002;13:373–8. Lemeshow S, Hosmer DW, Klar J, Lwang SK. Sample size for continuous response variable. In: Adequacy of Sample Size in Health Studies. Chicester, West Sussex: John Willey & Sons Ltd.; 1990. p. 36-40. Thompson DD, Simmons HA, Pirie CM, Ke HZ. FDA guidelines and animal models for osteoporosis. Bone 1995;17:125S-133S. Lestari S, Utari EL. Metode pengenalan pola trabekula mandibula pada radiograf periapikal digital untuk deteksi dini risiko osteoporosis. Teknosains 2013;3:66-73. Available from: https://www.jurnal.ugm.ac.id/teknosains/article/view/6129. [Last accessed on 2017 Aug 10]. Kasagi S, Chen W. TGF-beta1 on osteoimmunology and the bone component cells. Cell Biosci 2013;3:4. Sfeir C, Ho L, Doll BA, Azari K, Hollinger JO. Fracture repair. In: Lieberman JR, Friedlaender GE, editors. Bone Regeneration and Repair Biology and Clinical Application. Totowa, New Jersey: Humana Press; 2005. p. 21-44. Yasui T, Kadono Y, Nakamura M, Oshima Y, Matsumoto T, Masuda H, et al. Regulation of RANKL-induced osteoclastogenesis by TGF-β through molecular interaction between smad3 and traf6. J Bone Miner Res 2011;26:1447-56. Yan T, Riggs BL, Boyle WJ, Khosla S. Regulation of osteoclastogenesis and RANK expression by TGF-beta1. J Cell Biochem 2001;83:320-5. Langdahl BL, Carstens M, Stenkjaer L, Eriksen EF. Polymorphisms in the transforming growth factor beta 1 gene and osteoporosis. Bone 2003;32:297-310. Teitelbaum SL. Stem cells and osteoporosis therapy. Cell Stem Cell 2010;7:553-4. Jeong JH, Choi JY. Interrelationship of runx2 and estrogen pathway in skeletal tissues. BMB Rep 2011;44:613-8. Shui C, Spelsberg TC, Riggs BL, Khosla S. Changes in runx2/Cbfa1 expression and activity during osteoblastic differentiation of human bone marrow stromal cells. J Bone Miner Res 2003;18:213-21. Kini U, Nandeesh BN. Physiology of bone formation, remodeling, and metabolism. In: Fogelman I, Gnanasegaran G, Van der Wall H, editors. Radionuclide and Hybrid Bone Imaging. Berlin: Springer; 2012. p. 29-57. Clarke B. Normal bone anatomy and physiology. Clin J Am Soc Nephrol 2008;3 Suppl 3:S131-9. Pino AM, Rosen CJ, Rodríguez JP. In osteoporosis, differentiation of mesenchymal stem cells (MSCs) improves bone marrow adipogenesis. Biol Res 2012;45:279-87.